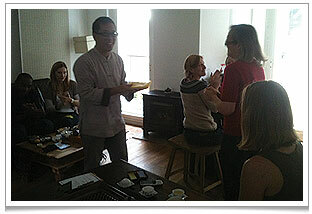 teanamu chaya teahouse > teahouse stirrings blog > happy new year! 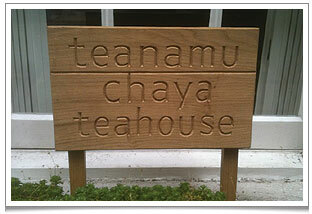 Teanamu Chaya Teahouse sprang into life in February 2011! 2011 has been a thrilling year for us at teanamu. Chaya Teahouse sprang into life at the end of February! Each weekend it’s filled with people from London and from all over the world taking pleasure in enjoying fine teas, properly brewed, along with our own pâtisserie, desserts and dim sum creations. The atmosphere is serene and companionable, just as we hoped. People – we like to think of as our ‘tea friends’ – hang out at the teahouse, come back time after time, introduce their friends who then pop up months later with other friends… it’s taking shape just as we envisaged it, and even better! We are so, so grateful. I myself feel like the teahouse proprietor in the drama ‘Cha Guan, Teahouse’ (see my blog post about the TV version here ) – he too got to hear so many stories, meet so many interesting new personalities! In the course of the year there have been many, many events that stand out. We started our ‘medteatation’ circles, for example. 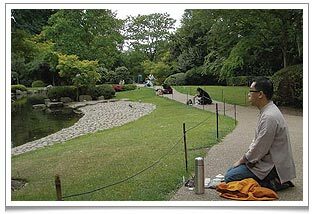 These simple, silent rituals happened both at Chaya Teahouse and in Holland Park organized around the beautiful lake in the Kyoto Garden. How fabulous, what a delight! I can’t wait for the Spring to start doing that again! What I’m proudest of in the year, perhaps, is helping launch not one, but two, books of ‘tea poetry’! First came ‘Distinguished Leaves’, composed by Britain’s very own Tea Poet, Elizabeth Darcy Jones. These are original verses, full of wit and gracefulness, describing particular human characters as if they were teas! Elizabeth even, extremely kindly, wrote and included one about me, framed a copy by hand and presented it as a gift to Chaya Teahouse. The book makes a gorgeous little gift for a birthday or even a ‘Valentine’, and right now we have copies for sale at Chaya Teahouse and you can also get them at distinguishedleaves.com. We have also worked with Elizabeth to select her favourite tisane, the Tea Poet’s Tisane, consisting of Organic Emperor Pu Erh 2008 vintage together with whole rosebuds (I call it ‘work, but it was a lot of fun trying out the different combinations of flowers and fruits!) 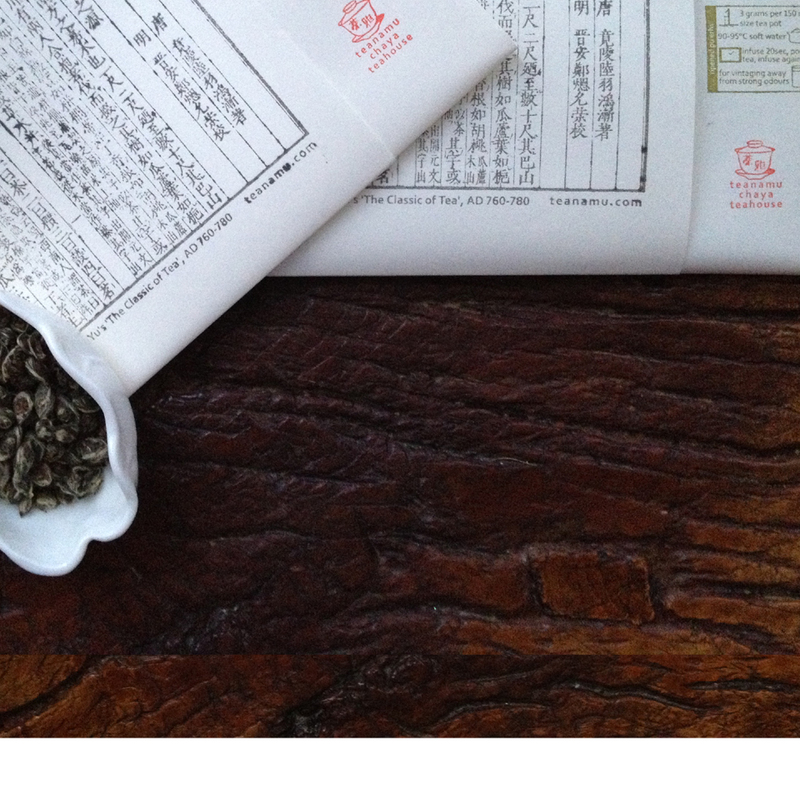 The tisane, a lovely merging of East and West, is also available at Chaya Teahouse and at distinguishedleaves.com. Lorraine Mariner reading from her compilation ‘Ten Poems About Tea’ at the launch at Chaya Teahouse. The second launch party was for Lorraine Mariner’s ‘Ten Poems About Tea’, a sweet little anthology cleverly disguised as a greeting card. 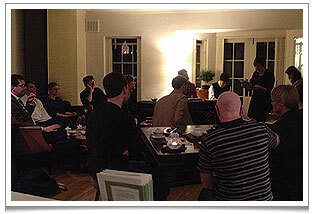 It was a lovely recital evening in November, with musicians, a singer and several readers joining in. Sincerest thanks to one and all! 2012 will bring more exciting happenings at Chaya Teahouse. Several new teas will arrive, including one which is the SUPER celebrity of the Oolong world. And we are planning more events, classes, the launch of a brilliant new Newsletter, and fantastic new menus to tickle the tastebuds and stimulate the mind! Oh, and we’re formulating ideas for taking a whole group of tea friends to China to participate in a week-long practical tea workshop. You can learn everything from picking tea to making your own Yixing purple clay teapot! Email me at teanamu if you’d like to know more. Finally, I just want to express my deepest gratitude to my tea friends, all the feedback, the kind reviews, the chats, the friendship above all else. This has been an experience already enriching beyond measure, and I can’t wait for the new year to see what will unfold! Happy New Year, everyone! 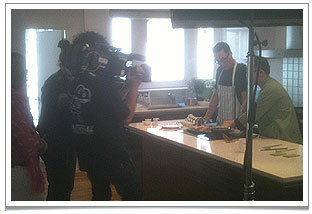 It was such an honour to have Gok Wan filming a TV pilot at Chaya Teahouse! 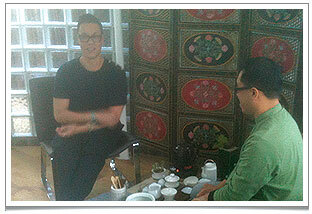 Here, I am showing Gok Wan how to use tea as an ingredient in cooking in our “tea cookery theatre“. 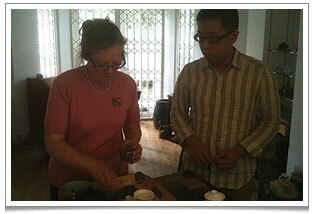 Our first tea artisan training at Chaya Teahouse with Britain’s Tea Poet, Elizabeth Darcy Jones. 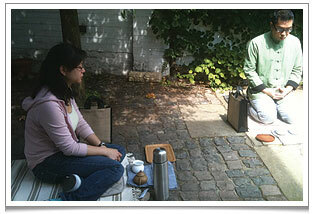 MedTEAtation at Kyoto Garden in Holland Park this summer. 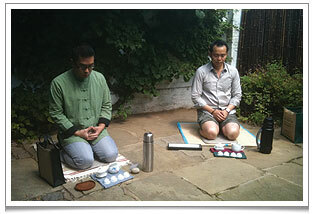 MedTEAtation ritual at Chaya Teahouse in the forecourt with our tea friend, Sam. 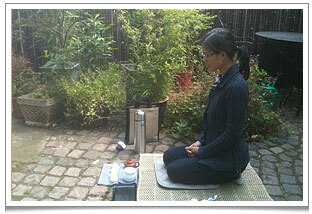 Our valued tea artisan, Nhi, joined us for medTEAtation this summer. Our most ardent supporter and best friend, Charles, enjoying a quiet moment at medTEAtation. 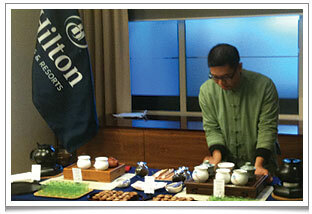 We have also hosted several tea ceremonies at corporate events. It’s been far too long since I’ve seen you and am definitely going to make it a new year’s resolution to visit you at the tea house in 2012, the sooner the better. So pleased for you that it’s going so well and am confident you will go from success to success. Thank you very much and all the best wishes for you too!